You are currently browsing the archives for the Marty Robbins category. Marty Robbins didn’t talk his World War II combat experience in the South Pacific. He seemed to put it behind him during his life as a country music entertainer, Nashville businessman, and NASCAR driver. Because he died in 1982 at age 57, Marty didn’t live long enough to willingly discuss that period of his life. Many veterans waited until their 70s and 80s to feel comfortable about reminiscing. Why did you choose Faron Young as a biography subject? I’d been a fan since the first time I saw him in concert, and he wouldn’t let me walk the three miles back to my college dorm. He insisted on taking me there in his tour bus. Over the years, after graduating from college and joining the Navy, I attended Faron’s concerts whenever possible. He would salute when he recognized me. After his death in 1996, his name was seldom mentioned and his music seldom played. I feared he would be forgotten, and I didn’t want that to happen. This sounds like a huge undertaking. Did you have a decisive “go-ahead” moment? I attended a speech by A. Scott Berg, author of the Pulitzer Prize-winning Lindbergh. He described writing letters to Anne Morrow Lindbergh, whom he didn’t know, and finally obtaining her acquaintance and support. His story inspired me. I decided to take a trip to Nashville in search of people who knew Faron. Were his acquaintances ready to discuss him with you? Did you have access to his family? Did you learn anything about Faron that no one else knew? I discovered a person who hid insecurities behind self-destructive behavior and a gregarious personality, an individual whose suicide should have not been a surprise. But during his lifetime, no one possessed enough clues to be able to see the path now evident in hindsight. Is there a lesson in his life that might help others in similar situations? Does the book offer insights to readers who are not country music fans? My research led me to conclude Faron suffered from undiagnosed depression, which manifested itself in alcoholism, abusive behavior, devil-may-care attitudes, and suicide. I hope people will recognize themselves or family members in some of the incidents in the book. Seeing such problems occur in Faron’s life might help readers realize changes they should make in their own lives. I’ve heard that Faron sent you a message in a dream. Is that true? My brother, who never met Faron or saw him in concert, dreamed he and Faron were on a cruise ship headed to Hawaii. They were discussing country music history and couldn’t think of a particular person’s name. My brother said his sister Diane would know the name and, by the way, she was writing Faron’s biography. Faron said he knew that. What my brother remembered most vividly was Faron’s blue suit, and he was surprised when I told him blue had been Faron’s favorite color. I’m no expert in dream interpretation, but I took this as a message that Faron approved of my biography project. How did you start your writing career? What motivated a military officer to write a country singer’s biography? Country music has always been of great interest to me, and I needed a plan for life after the Navy. I self-published two books while on active duty, as well as writing a five-year newspaper column about my travels. My childhood memoir, A Farm in the Hidewood: My South Dakota Home, preserved a piece of my family history. Navy Greenshirt: A Leader Made, Not Born covered 18 years of my career as an aircraft maintenance officer. By the time I finished those books, I had already started Faron’s biography. 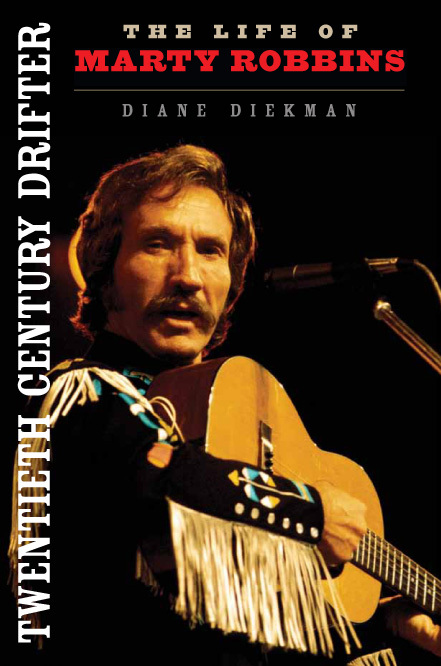 Twentieth Century Drifter: The Life of Marty Robbins is about another member of the Country Music Hall of Fame. In addition to being a famous singer and Grand Ole Opry star, Marty raced in NASCAR events and was a World War II combat veteran. I’m doing research and interviews and have written several chapters. I’d like to hear from anyone who has information about Marty Robbins. Where can we find Faron Young’s music today? New CDs are still being released, usually in Europe. Amazon.com has an excellent selection of his music. It’s also available through various mail order venues and in stores that carry classic county selections.